Shinjuku Gyoen has meandering tree-lined paths connecting a greenhouse and three gardens: a Japanese traditional garden (think ponds, bridges, teahouses), an English landscape garden (think wide lawns surrounded by trees), and a French formal garden (think rose bushes and sycamore trees). 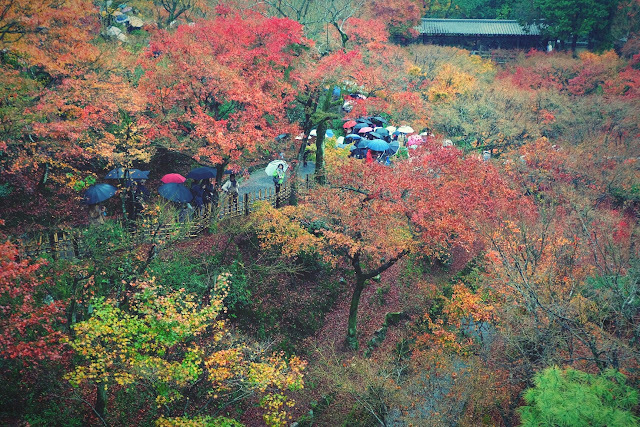 When we visited at the end of October, most of the trees were still green, too early for koyo (autumn colored foliage). 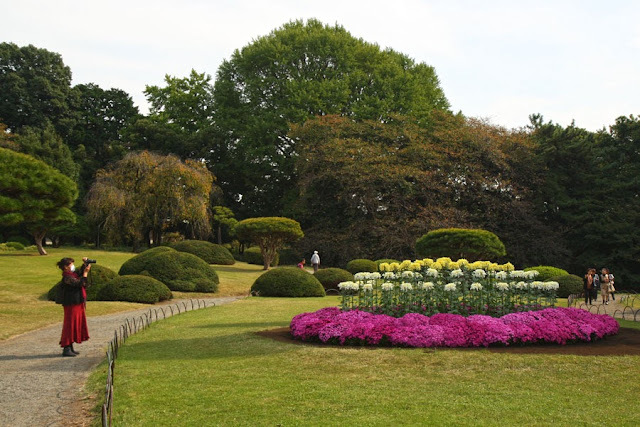 A nice surprise though were the large chrysanthemums of different colors in the Japanese garden. In Japan, the chrysanthemum is representative of autumn, and most importantly a symbol for longevity and rejuvenation. It is the Imperial Family Emblem and can also be seen on a 50 yen coin and on the Japanese passport. 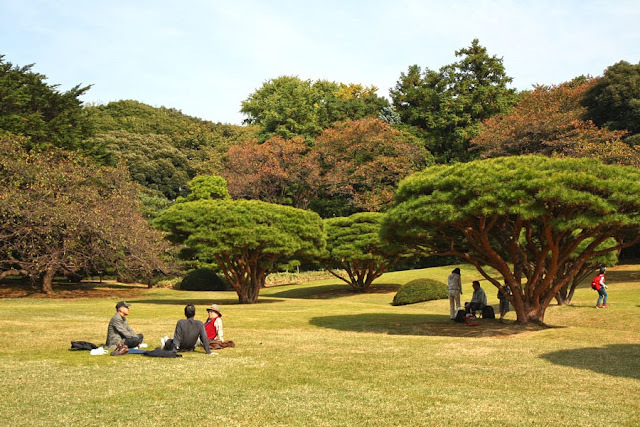 It was lovely to see families and friends picnicking on the lawns and under trees all over Shinjuku Gyoen, elderly Japanese painting sceneries, and people relaxing on benches or walking along the tree–lined paths. Sadly, we missed to check out the greenhouse. 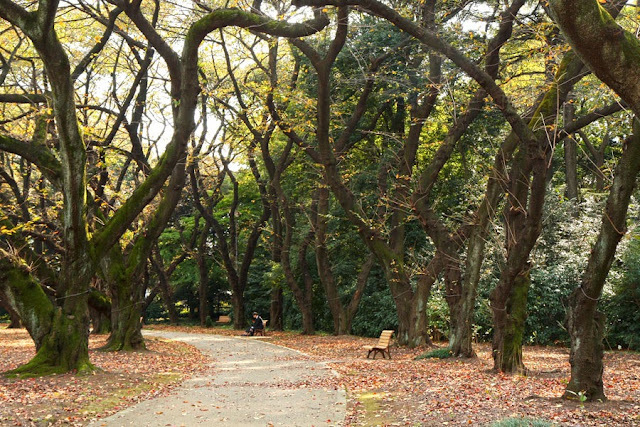 Shinjuku Gyoen is so large that we entered after breakfast and came out there hungry and longing for lunch. 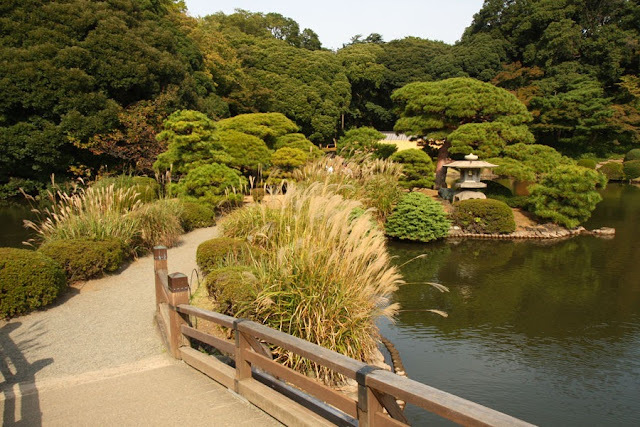 Directions to Shinjuku Gyoen: Shinjuku Gyoen has three gates, Shinjuku Gate (the closest subway stations are Shinjuku-gyoenmae and Shinjuku sanchome), Okido Gate (the closest subway station is Shijuku-gyoenmae), and Sendagaya Gate (the closest subway station is Kokuritsokyogijo and the closest JR station is Sendagaya Station). 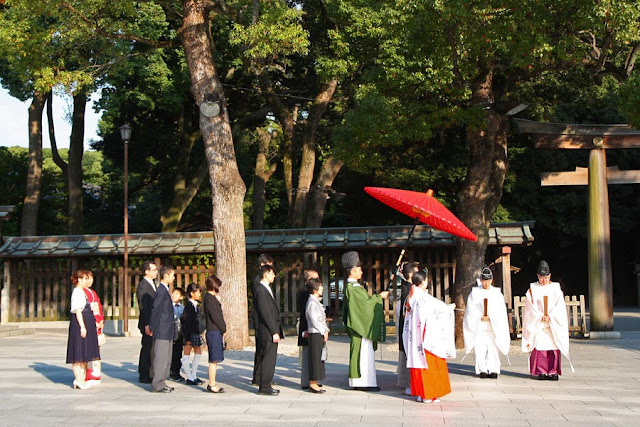 Meiji Jingu is an Imperial shrine dedicated to Emperor Meiji (born in 1852 and ascended the throne in 1867) and Empress Shoken. It was built in 1920. 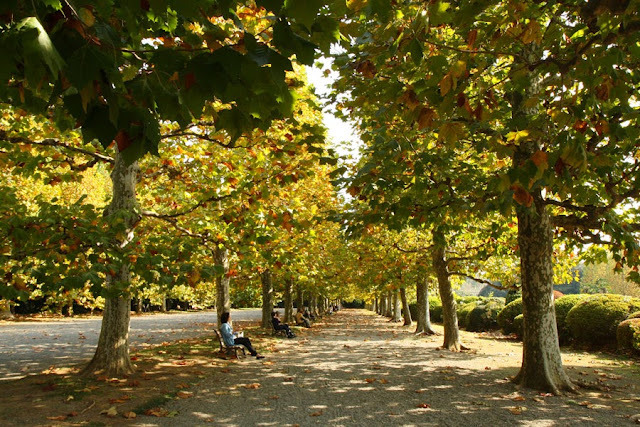 The Meiji shrine grounds cover a large area, and in it are the main shrine, the Treasure House (a museum of items used by the Emperor and Empress), and the Inner Garden. 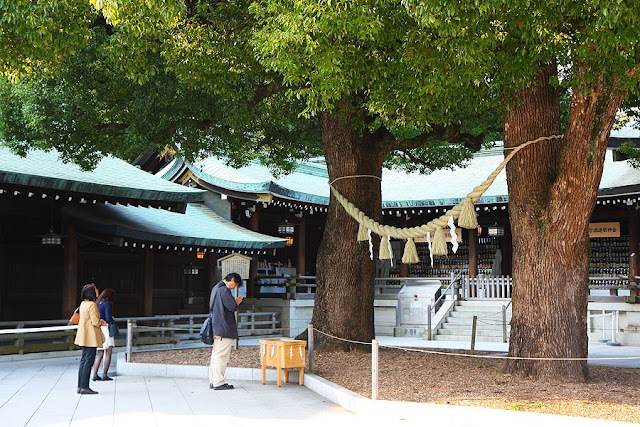 The main shrine is a 10-minute walk along pathways surrounded by trees starting from either north or south entrance. 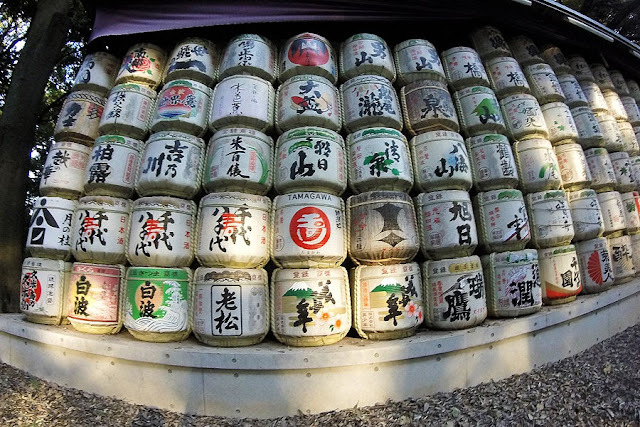 During the walk to the main shrine, I spotted a wall of sake barrels called kazaridaru. These were donated by sake brewers from all over Japan to ask for prosperity. 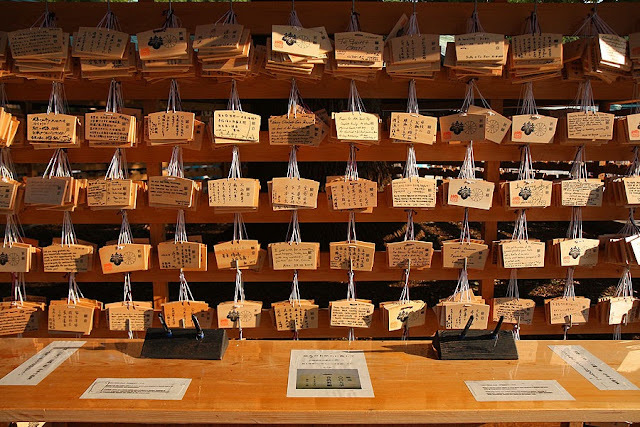 At the shrine we witnessed a Shinto wedding ceremony, people praying, and people writing wishes on a wooden plate called ema. We did not get to visit the Treasure House (it was closed) nor the Inner Garden. 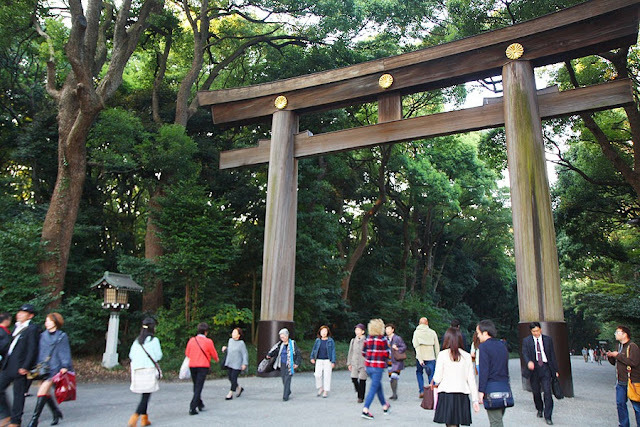 Directions to Meiji Jingu: Take the JR Yamanote Line to Harajuku Station. If you have the Tokyo Metro Pass, the closest subway station would be Meiji-jingumae Station. Shibuya has many shopping centers but we did not go there for a shopping spree. We went there for two free things. 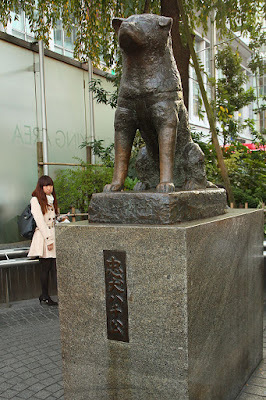 One: to see Hachiko perpetually waiting outside Shibuya Station. And two: to witness the busiest crosswalk in the world. 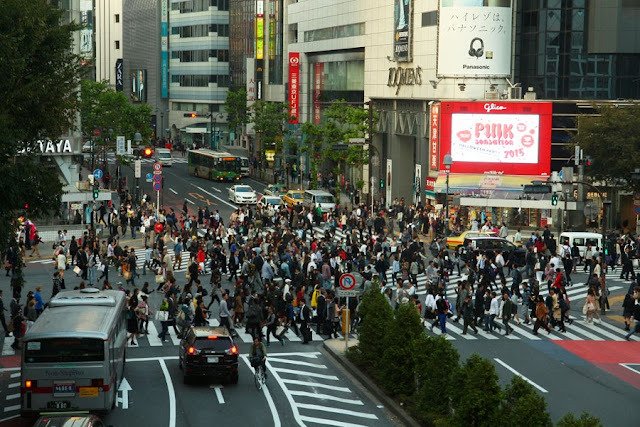 Though it wasn't rush hour, thus the 5-way crosswalk wasn't that busy, we still did not venture to join the pedestrians, instead we watched the masses from the upper floor of Shibuya Station. Directions to Shibuya: Take either the subway or the JR to Shibuya Station. We only satisfied ourselves at admiring the 333–meter tall orange and white tower from street level because we were either too hungry or too cheap (I forget which) to go up the observatory. Admission to the observatory would have cost 1600 JPY for both the main observatory (150m high) and the special observatory (250m high). (900 JPY for the main observatory only.) None of us were One Piece fans so we didn't bother going to the One Piece Tower either (located in Tokyo Tower's Foot Town, the building under the Tower). 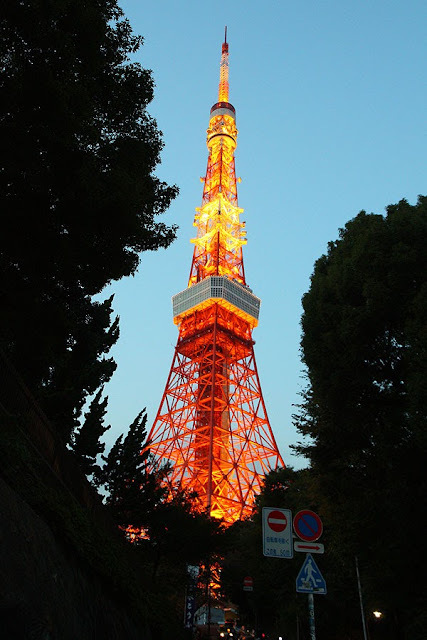 Directions to Tokyo Tower: Tokyo Tower can be reached by bus, subway, or rail (JR). There are many options on how to get there, but the closest subway station, a 5–minute walk, would be Akabanebashi Station on the Metropolitan Subway Oedo Line. 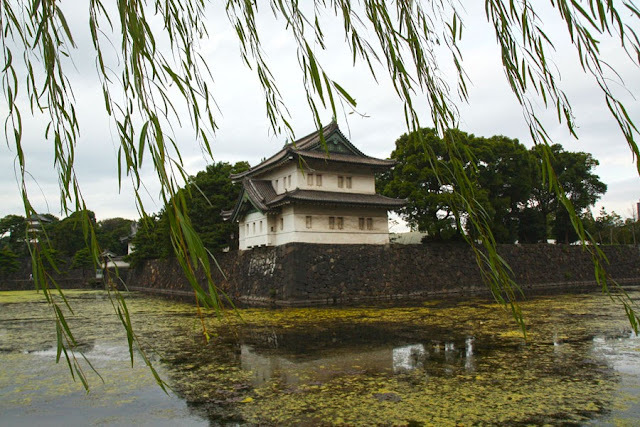 Because we were not able to secure slots for the Imperial Palace Tour, we only saw parts of the Imperial Palace from outside...which were just the Nijubashi Bridge and the Fushimi-yagura Keep. If we had secured slots for the tour, we'd have been able to enter the palace grounds but not the buildings, but we wouldn't have understood a thing because the tour would have been conducted in Japanese. 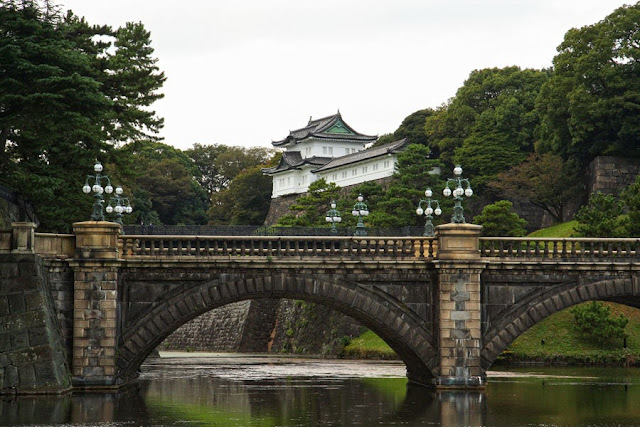 Directions to the Tokyo Imperial Palace: Refer to the Imperial Household Agency website for the numerous options on how to reach the five gates of the Tokyo Imperial Palace grounds. 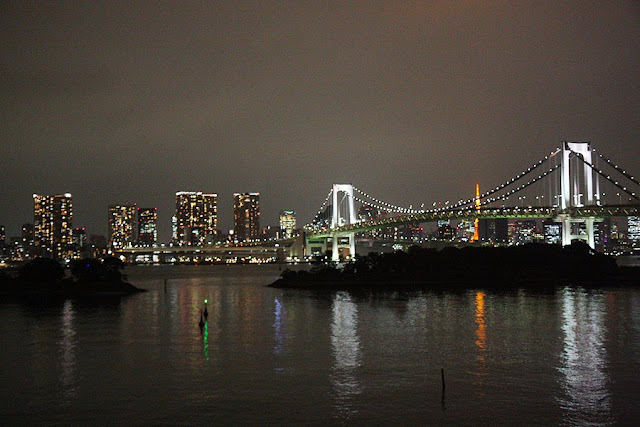 Odaiba お台場, a shopping and entertainment district on a man–made island, was our first stop in Tokyo. 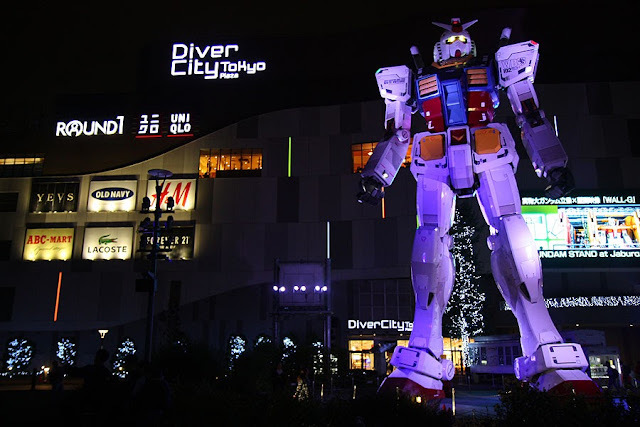 Not for shopping, but for the jaw dropping 18-meter tall Gundam at DiverCity Tokyo Plaza. I am not a fan of Gundam, but still it was quite a sight to see. Especially when it started to move complete with lights and sounds in sync with the short episode (in Japanese) playing on the large screen. Gundam fans would surely love DiverCity Tokyo Plaza because it also has a Gundam Cafe and Gundam Front Tokyo (a museum of all things Gundam). Unfortunately for Gundam fans who are planning to visit in the next few months, the 18-meter tall Gundam is scheduled to be taken down in March 2017 and Gundam Front to close in April 5, 2017. The good news is something bigger and better are coming! Gundam Base will replace Gundam Front and will open Summer 2017, and a new and an even taller (close to 24 meters) Unicorn Gundam will rise in Autumn 2017. After gracing Gundam with our presence (ha! 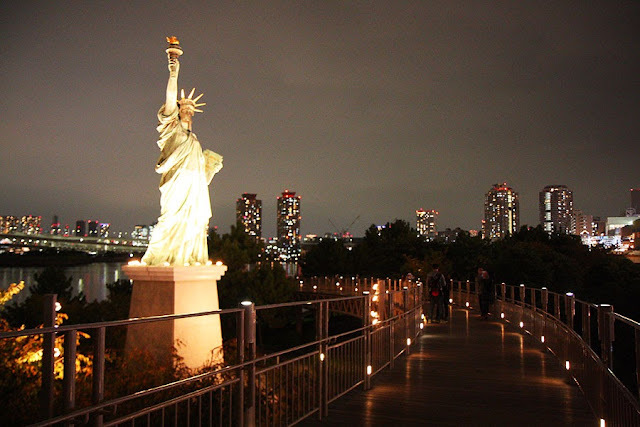 ), we went for a chilly (it was end of October) walk along the seaside park where we saw a Statue of Liberty, tall buildings all lit up for the night, including the futuristic looking Fuji TV Building with its spherical observation room, and a beautiful night view of the Rainbow Bridge which is not rainbow colored (different colors can only be seen during special light up events). 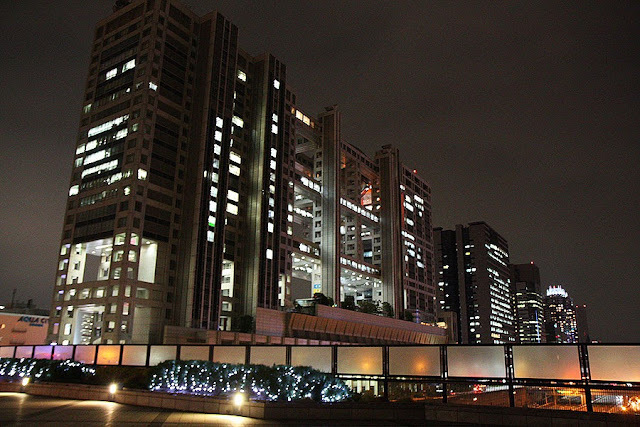 Decks Tokyo Beach - a shopping center with indoor amusement parks (Tokyo Joypolis, Daiba 1-chome Shoutengai, Legoland Discovery Center Tokyo) and museums (Madame Tussauds Tokyo, Tokyo Trick Art Museum, Odaiba Takoyaki Museum). National Museum of Emerging Science (Miraikan) - an interactive science museum. Exhibits are in Japanese and English. 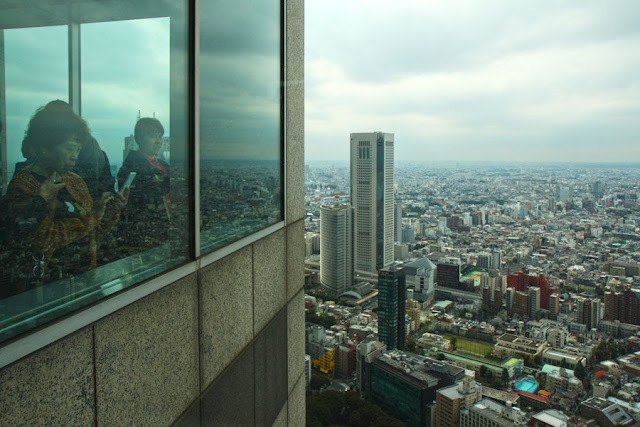 Telecom Center - viewdeck (admission: 500 JPY) on the 21st floor. Oedo Onsen Monotagari - an onsen (hot spring) theme park set in the Edo Period. Toyota Mega Web - showcases Toyota's cars from past to present. Panasonic Center - displays Panasonic's newest products and technologies, an exhibit of how Panasonic sees life in 2020 to 2030, and a museum of science and mathematics in nature. Oh well. More reasons to come back to Tokyo. We stumbled upon this little restaurant while walking from Shinjuku Gyoen National Garden to Yoyogi Station. We were quite hungry and the shokuhin sampuru (plastic food samples) in the clear glass shelf outside this small corner restaurant caught our eye. We don't know what the dishes were—the descriptions (and prices) were all in Japanese—but everything looked good. Thankfully, I had paid attention to my elementary Chinese lessons way back when, that I could read the prices...and it was quite cheap with dishes starting from 230 JPY. Order and pay here...if you can figure it out. It's in Japanese! 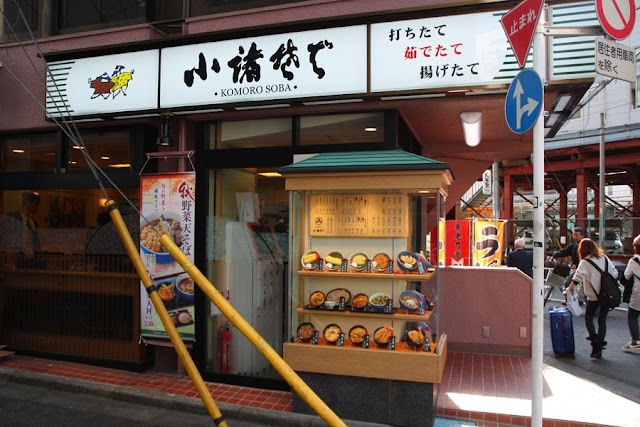 Although the restaurant's name is Komoro Soba, it does not only serve soba, but also donburi (rice toppings). We studied the display outside, picked what we wanted to order, went through the door and found a white kiosk where we had to input our order and pay. It took us quite some time because it was in Japanese! (Tip: Memorize or take a photo of the Japanese label on the display! Or just go before or after the usual meal hours when the restaurant isn't busy, the kitchen staff can surely help.) After paying, the kiosk spit out the change and the meal ticket. We gave our tickets to the kitchen and waited for our order. With speed and efficiency, we didn't have to wait long. As soon as we got our food, we settled down and ate our rice bowls (yes, it's a soba restaurant but all of us rice eaters chose a donburi). The serving looked small but turned out to be filling. 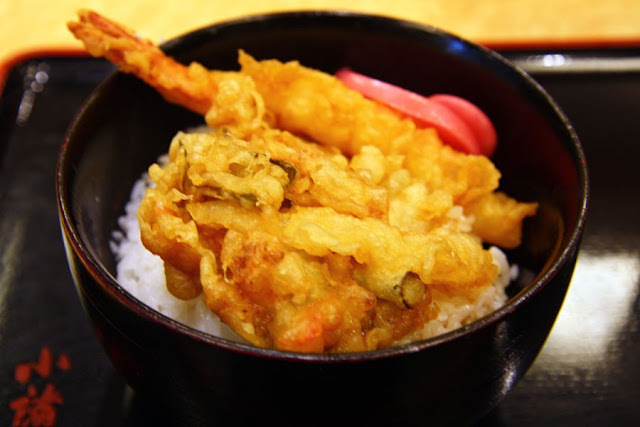 We all agreed that the food was very good (mine was ten don 天丼 or tempura donburi). But we couldn't dilly dally in this place as more office workers on lunch break were spilling in through the door. Where can you find Komoro Soba? It has more than 80 branches in Tokyo! The one we stumbled upon was at 5-20-16 Sendagaya, Shibuya-ku. Somebody in the group had the sense to search for ramen places and suggested we hunt for Gogyo, a restaurant that serves burnt ramen so says whatever it was he found on the internet. Off we went, no questions asked, after having our mandatory tourist photo taken with Tokyo Tower in the background. 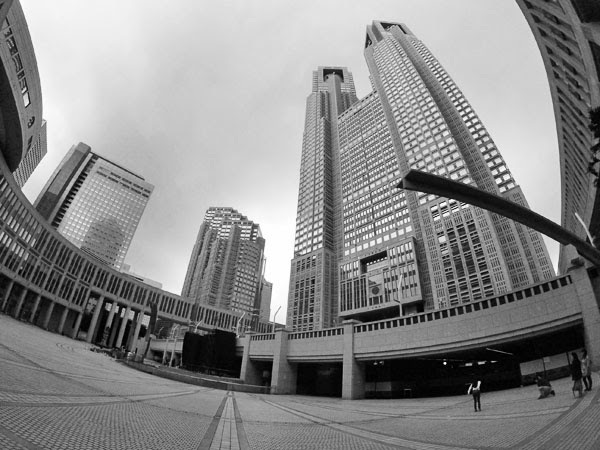 From Kamiyacho Station on the Tokyo Metro, it was just one stop and a 10-minute walk away. But I was so hungry that it felt like such a long walk and I had to ask "Are we there yet?" To my relief, and I am sure to my friends' relief (no more hearing the annoying "Are we there yet?" question from me), we found Gogyo. I don't know what else was on the menu because I just zoomed in on the burnt ramen offerings: kogashi shoyu ramen and kogashi miso ramen. According to the menu, the kogashi broth is "prepared with lard (!) flambéed at 300°C." 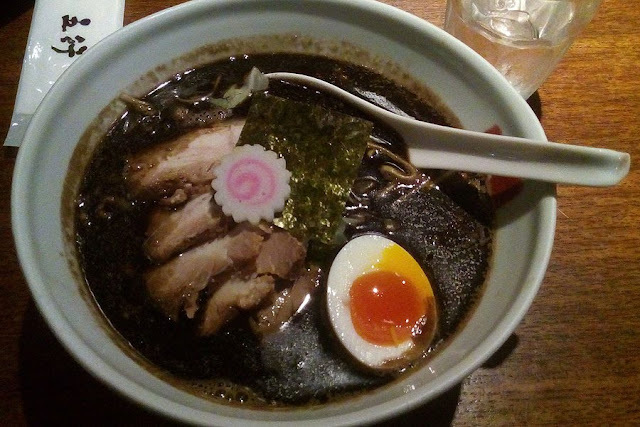 I am no food expert and don't know how to describe food, but, my oh my, my kogashi shoyu ramen with char siu was really really really good!!! Quite expensive at 1,130 JPY but well worth every yen I had to squeeze out of my wallet! Where can you find Gogyo? 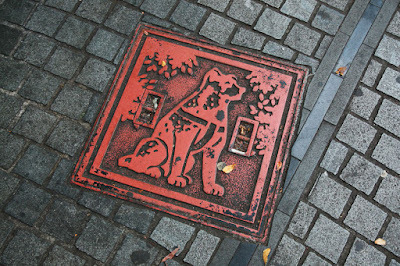 There is only one in Tokyo and it is at 1-4-36 Nishiazabu, Minato-ku. Aside from Tokyo, there are two other branches in Japan: Kyoto and Nagoya. For our three nights in Tokyo, we stayed at an apartment in Shinjuku booked through Airbnb. If I travel to Tokyo again with three friends, I would stay here again. Why? Location. The apartment is off the main road in a quiet residential area. 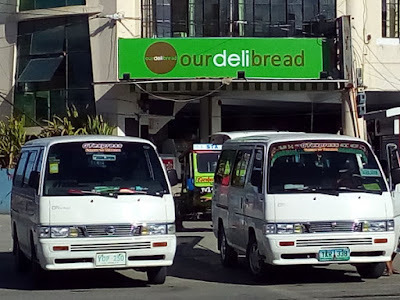 There are several convenience stores and restaurants nearby. 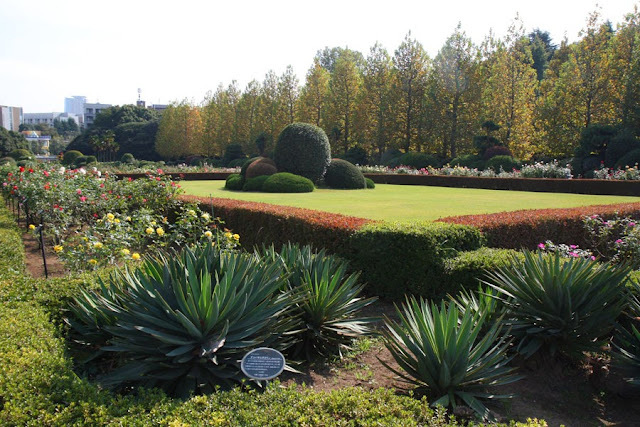 And it is just a 5-minute walk from Higashi-Shinjuku Tokyo Metro Station and a 10-minute walk from Shinjuku Station. It was very easy to find thanks to the clear instructions given by the Airbnb host. Privacy. The apartment sleeps four (two bunk beds), has a mini kitchen, and a toilet and bath. Though small—when we have to open our luggage at the same time, there is barely room to move from the bedroom to the bathroom or the kitchen; the size of the bathroom is okay for Asians but will be too small for westerners — it's our own little apartment and we don't have to share it with strangers. WiFi. A pocket WiFi is provided. Price. The apartment cost us only 34,400 JPY for three nights for four persons. That's about 2870 JPY per person per night. About the same or even cheaper than staying in a dorm bed in a hostel, which usually ranges from 2500 JPY to 3800 JPY per person per night. Japan has always been on top of my to-visit list, but my wallet, convinced that it is a very expensive country, kept pushing it to the bottom. Then my brain slapped my wallet hard on its leatherette face and said "If not now, when? This mustache is not getting any younger." I bought a ticket with nary a travel companion in sight. It was months after buying a plane ticket did I find three travel companions. When they themselves finally found and bought not so expensive tickets, we came up with a 10-day itinerary. Arrive in Narita, blaze from Tokyo to Hiroshima, spending just a day or two in each of the six prefectures our ten days would allow, then wave またね "mata ne" from the plane in Kansai. We and our wallets can do this! 頑張って! Ganbatte! 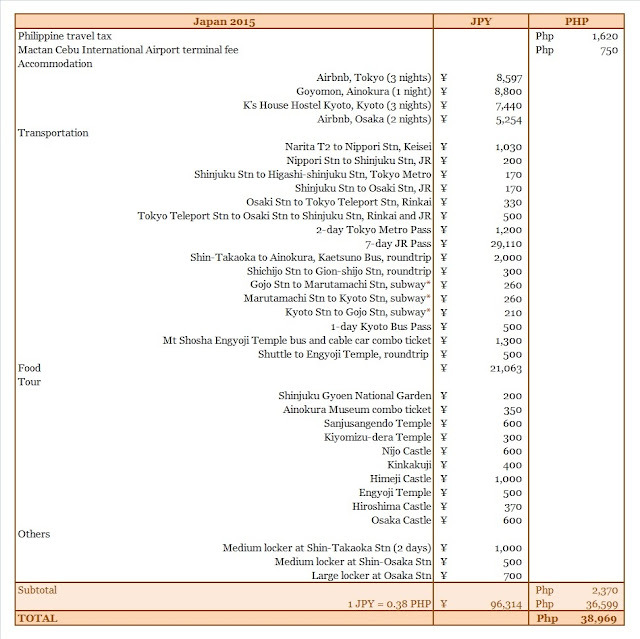 This trip happened in 2015 when the exchange rate was 0.38 PHP per 1 JPY. At the current exchange rate of 0.45, the total in Philippine peso would be 45,325. I've always thought I'd need about Php 10,000 per day in Japan. As you can see from the table of expenses above, I was wrong. And I'm so glad I was wrong. Yes, it is still expensive for a white collar worker like me. And yes, this is the most expensive trip I have ever been on. But not an impossible trip, see? Plane Ticket. Regular priced roundtrip plane tickets between the Philippines and Japan can go from Php 10,000 to Php 25,000 depending on the destination and on the airline. Like all of my posts about expenses, I did not include the cost of the plane tickets because I usually buy them six to twelve months in advance, during airline promotions. Since Filipinos need a visa to enter Japan, it is recommended to obtain a visa first before buying a ticket. I risked it though knowing full well that if I wasn't granted a visa, my tickets would not be refunded. Visa. Philippine passport holders should apply for a visa not more than three months before their intended date of travel. Visa applications can only be processed through accredited travel agencies. Applying for a single entry visa would cost Php 1,300. In addition to the visa fee, expect to shell out some cash to obtain these requirements: photo, bank certificate, birth certificate, marriage certificate. Accommodation. 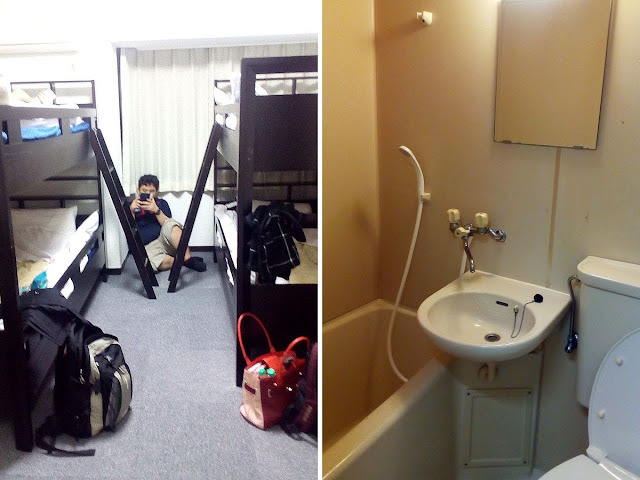 I had set a budget of Php 13,500 per person (about 35,500 JPY with an exchange rate of 0.38) for 9 nights for accommodation (average of Php 1,500 a night) and the one we had assigned to take care of booking accommodations did a very good job of keeping within budget (total of 30,091 JPY for 9 nights). My three friends and I stayed in Airbnb apartments, a hostel, and even a minshuku (a family operated bed and breakfast)! There are many properties on Airbnb, you just have to be meticulous as the initial price shown is the cost per night only; there will be additional fees (cleaning fee and service fee). A dorm bed in a hostel would cost 2,500 JPY and above; most hostels in Japan do not offer free breakfast. The most expensive accommodation for this trip was the minshuku in Ainokura Village, which set us back 8,800 JPY (Php 3,350) each for a night, but this also included awesome home cooked breakfast and dinner and a very memorable stay at a farmhouse. Food. You can save on food if you are willing to eat onigiri (rice balls) for your every meal. We decided not to be such tightwads and ate at a variety of places. Sometimes we'd buy boxed meals from convenience stores, sometimes from shops at the stations, sometimes we'd eat in fastfood donburi or soba or curry shops, sometimes in restaurants (like Gogyo in Roppongi, their burnt ramen was so good!). 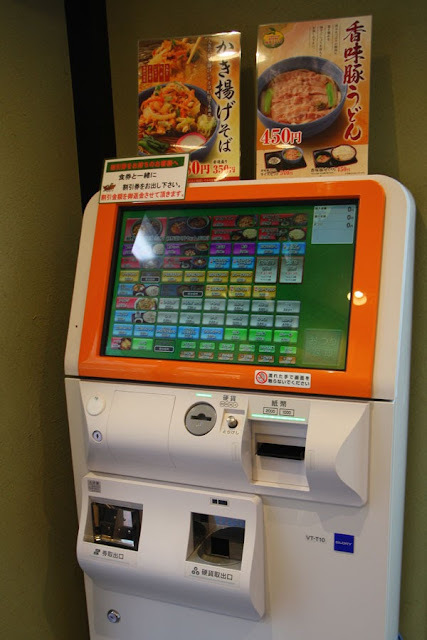 Our meals would range from 400 JPY to 1,200 JPY, spending an average of 2,300 JPY per day. Transportation. Fares in Japan are really high (minimum fare for the subway is 150 JPY) and taking the shinkansen (bullet train) would cost a chunk. It would be expensive to get lost in Japan. It is best to research and plot your itinerary beforehand then see which passes would be beneficial for your trip. In Kyoto, we forgot to buy a 1-day subway pass (600 JPY); with the pass we could have saved 130 JPY (see * in table of expenses). The 7-day JR pass (29,110 JPY if bought outside of Japan; 33,000 JPY if bought at select stations in Japan, on a trial run until March 31, 2018) ate almost a third of my budget, but with our itinerary, we also made the most out of it (we used the JR Pass for a total of 55,530 JPY on regular fares, taking the shinkansen seven times, and local lines and limited express trains several times). Admission Fees. 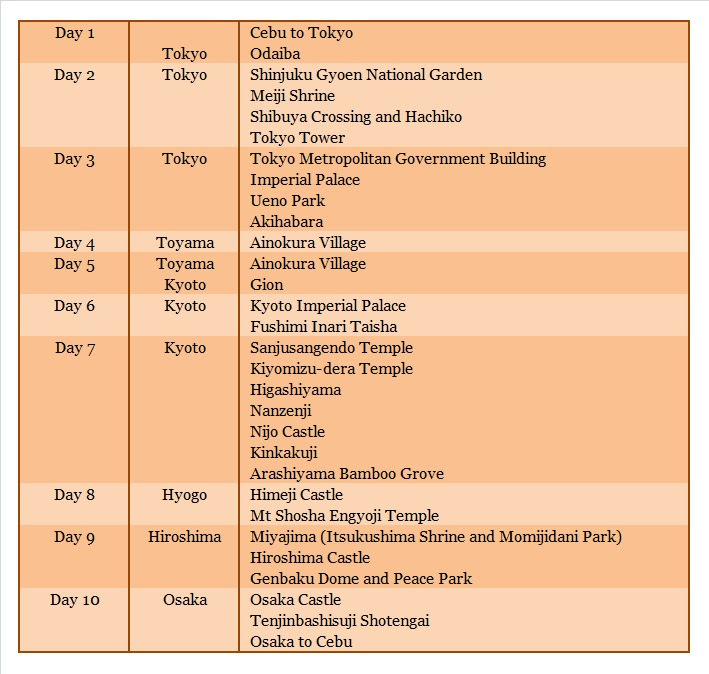 Most of the temples, castles, and gardens will charge an admission fee from 200 JPY to 1,500 JPY. Some would also have audio guides available for rent. Some would also offer combo tickets. Do research beforehand. Others. For this trip, we did not rent a pocket WiFi. Our Airbnb accommodations in Tokyo and in Osaka provided one, so we were connected in those cities. We survived going around Kyoto without one. What we did spend on were lockers to lessen our burden: we were staying just one night in Ainokura Village and did not need to take all our belongings with us; in Osaka, we left our bags in a locker because the check in time wasn't until late in the afternoon; on our last day, from check out time until flight time, we did not want to drag our bags around Osaka. Lockers can be found in every station, but not all stations will have the large lockers (700 JPY per day for a large locker; 500 JPY for a medium locker; 300 JPY for a small locker. The locker fee is per calendar day, not per 24-hour period). In the end, I was tired (we were always on the go, moving from one place to another), but I was absolutely glad I did it. Even before the plane could take off for home, my brain was already plotting a return (with my starving wallet shivering at the thought). 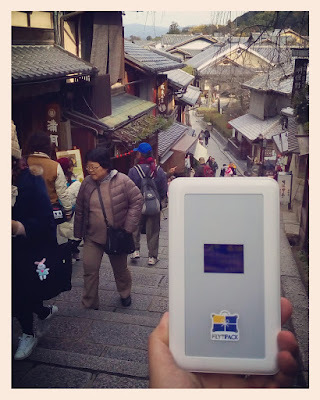 With a swagger, a portable WiFi in my pocket, and these apps, I roamed around the Kansai Region of Japan (my 2016 solo trip) like I owned the place...at least that's how I imagined myself. 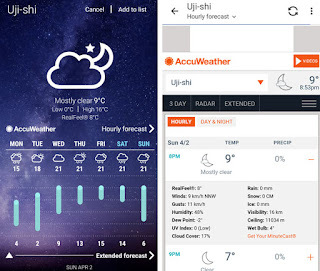 The point is, with the help of these apps, I didn't look like a lost puppy in the streets of Japan. Or so I hoped. it is easy to use – I just enter the location, date, number of persons, and click search. And because I have a maximum budget, I filter it by price and choose from the list. 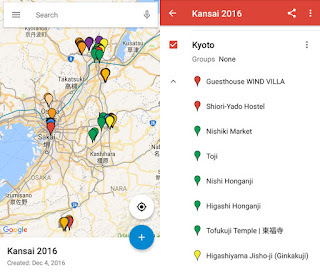 it has a map – it shows the exact location of the hotel/hostel/guesthouse/inn and also shows other nearby accommodations (and the corresponding price). it encourages guests to leave reviews – guest reviews are important! it offers free cancellation – most accommodations on Booking.com offer free cancellation up to a certain number of days before the trip. it requires no down payment – most accommodations on Booking.com will only ask for credit card details to confirm the booking but won't charge it (unless you cancel the booking after the free cancellation period). There are also accommodations that don't require credit card details to book! Payment will be upon check in. I didn't have to search for places and reorient myself every time. Minutes saved. I could change around my itinerary based on my energy level, weather, and the location/proximity of the sites I was interested in. Bus/Train fares saved. I could find shortcuts or take less trodden paths, like alleys or through residential areas (an added adventure). If I find something new and interesting that wasn't part of the plan, I could pin it on my map to remember its location in case I wanted to go back. Minutes saved from searching again and/or from racking my brain trying to recall the location. Japan's rail network is impressive that it can get impressively confusing. Even locals get confused! (I have seen it with my own eyes!) There are many different rail operators. There are many types of trains: shinkansen (bullet train), express, limited express, local, etc. In short, there are many choices to get from point A to point B anywhere in Japan! The Japan Trains app will pare down the options depending on the information you have entered. The results will show the departure time, arrival time, fare, and number of transfers. Click on one of the options to find out more about the route: which lines and connections to take, arrival and departure times for each connection, fare for each connection, and time it takes to transfer/walk between stations. 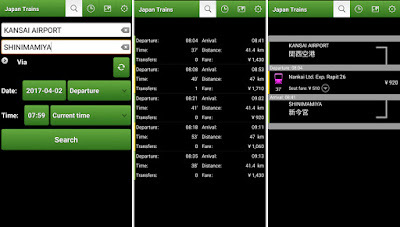 In the city of Kyoto, Arukumachi Kyoto app trumps the Japan Trains app. 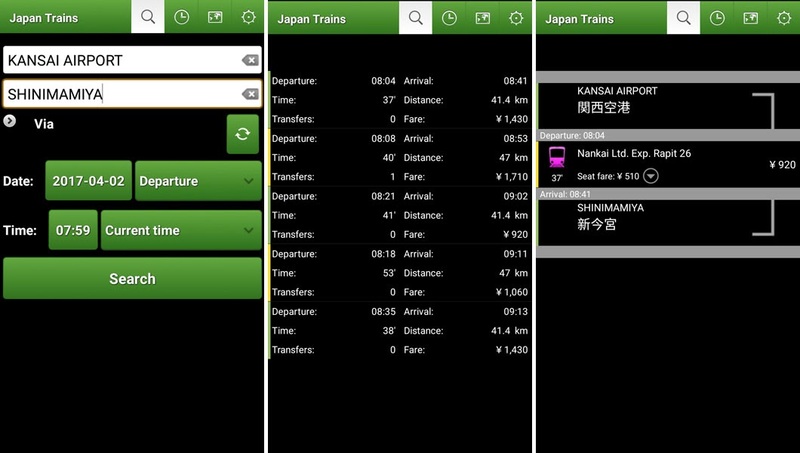 Although there are subway lines and railways in the city of Kyoto, most of the city's attractions can be reached by bus, and obviously the Japan Trains app is only for trains. For Arukumachi Kyoto app, just enter the departure and arrival areas (it doesn't have to be specific, just enter the street or tourist spot) and it will give more specific suggestions (station, bus stops, or spots). Search results will give you several options to get to your destination, showing the departure and arrival times, total bus fare (and if the 1-day Kyoto City Bus pass can be used), number of transfers, and what modes of transportation to take. Click on one of the options to find out more about the route: which bus/subway/rail to take, arrival and departure times for each connection, fare for each connection, and time it takes to transfer/walk between stops. Click on a connection to view the map. What I love about Arukumachi Kyoto's map is that it shows your current location, so when you're on the bus and have no idea if your stop is approaching, just check the map and watch the dot (you) move. Don't forget to press the bus stop button nearest you lest you miss your stop. With the guidance of the weather app, I could strut around the streets not looking like a fool for not wearing the right clothes, not looking like a newly hatched chick if I was caught in the rain mid-strut without an umbrella, not looking like a jello shivering on a blustery day. Philippine passport holders can enter some countries visa-free. Unfortunately, Japan isn't one of them. It is best to apply for a tourist visa to Japan not more than three months before your intended travel date. Reason for this is that a single entry visa, if granted, is usually valid for three months. Philippine Passport – The passport should have your signature and should have at least two blank pages. Application Form – Write N/A for not applicable items; do not leave blanks. Print the application form on A4 size paper. Do not forget to write the date and sign the form. Photo – 4.5 cm x 4.5 cm, with white background, taken within six months from the date of application. Affix the photo on the application form. 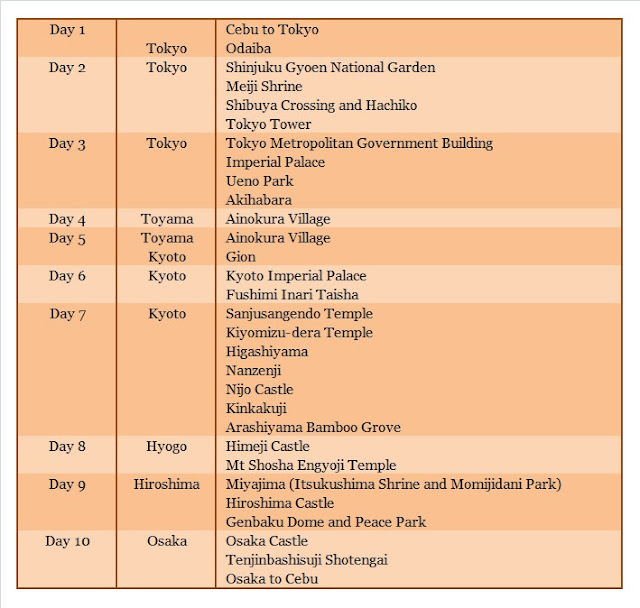 Daily Schedule in Japan – Use the Schedule of Stay template found in the website. Indicate the address and contact numbers of the accommodations you plan to stay in. 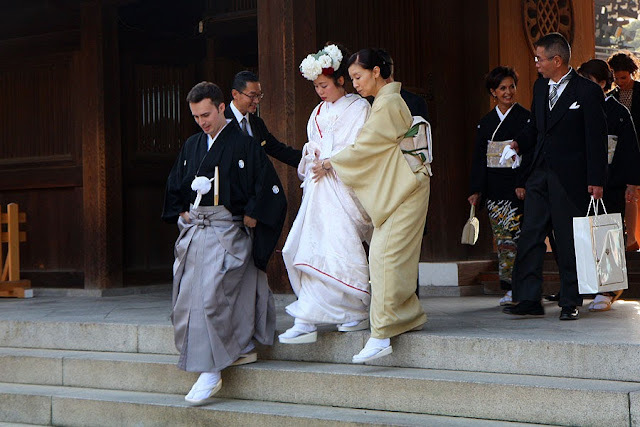 Old passports with previous visas to Japan – If you have previous visas to Japan, there is no need to submit your birth certificate and marriage certificate. Certificate of employment – if you are an employee. The document should contain your position, hire date, and salary. Photocopy of previous visas to Japan – no matter how old! Mine was from 1997! Note: All printouts and photocopies should be on A4 size paper. For the list of requirements for other visa types, please refer to the Embassy of Japan in the Philippines website. Tourist visa applications can only be processed through accredited agencies in Manila, Cebu, and Davao. The visa fee for a single entry visa is Php 1300 and the processing time is at least one week. Of the four accredited agencies in Cebu, I processed mine through Friendship Tours in AS Fortuna St, Banilad, Mandaue City since it was the most accessible for me. They checked my requirements before accepting my application (if a document is lacking, they will wait for you to submit it before forwarding your application to the consulate). Upon acceptance of my application and requirements, I paid them and was issued a receipt with the application number. They contacted me through text message once the passport was ready for pickup. ...that their language is Nihongo or Japanese. こんにちは みんなさん! Konnichiwa, minna-san! Hello, everyone! Prepare yourself to be greeted in Japanese and see signs in Japanese, written in a mix of Kanji (Chinese characters), Hiragana, and Katakana (used for non-Japanese loanwords). But do not worry, most tourist sites will also have signs in English and will have staff who speak English. ...that their currency is the Japanese yen 円. One US dollar is about 100 JPY, or 1 JPY is about 0.50 PHP. The current exchange rate might be lower or higher (do check the current rate), but I used that conversion just to give me an idea how much I was about to spend on a ramen (for easier mental calculation; my brains don't work when hungry). ...that their watches are set to Japan Standard Time (JST) which is 9 hours ahead of Greenwich Mean Time or Coordinated Universal Time (GMT/UTC +9), or one hour ahead of the Philippines. Speaking of time, for the Japanese time is very important. So never ever be late! ...that the country has four seasons: winter (December to February), spring (March to May), summer (June to August), and autumn (September to November). 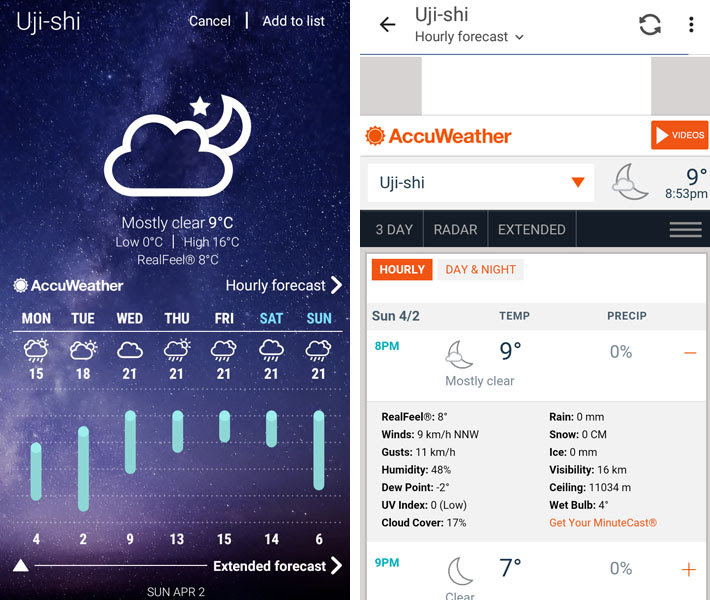 Depending on what month you visit (and which part of Japan you go to; for example, Okinawa is located on the south and rarely goes below 9ºC in the winter months), be prepared with the right clothes. 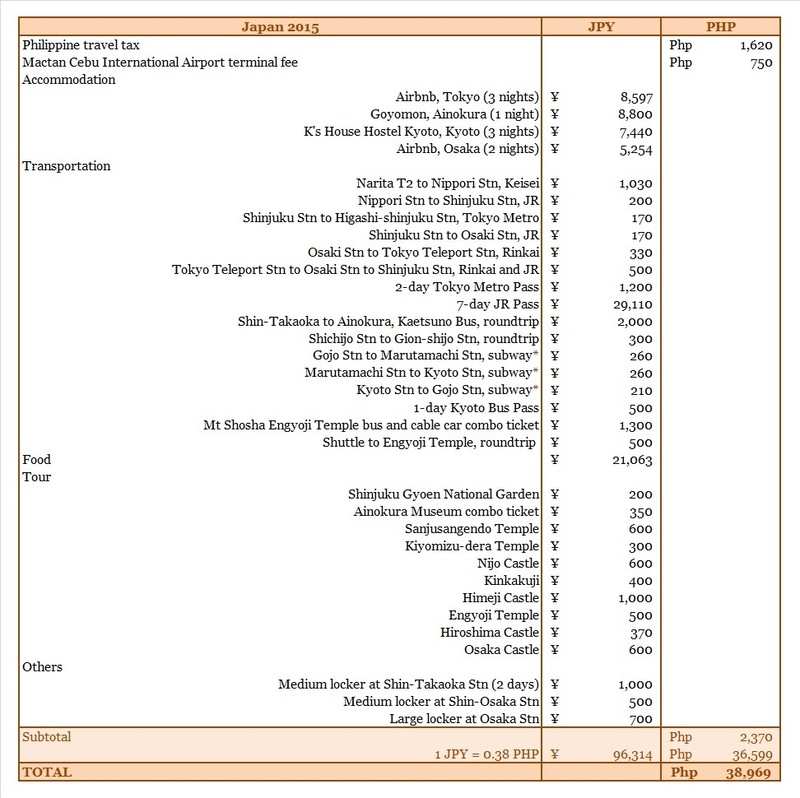 ...that Japan has a total land area of almost 378,000 sq. km., has 47 prefectures (these prefectures are further grouped into 8 regions), and has a million things to see and do. Thus a warning: planning a trip to Japan might be a bit of a challenge... a challenge on what not to include in the itinerary. ...that Japan uses Type A and Type B plugs at 110V. Most mobile phone and gadget chargers nowadays can be used for 100 to 240V, so you probably won't need a voltage converter. Some hostels/accommodations might also have USB ports. ...that Japan's transportation network is so extensive it can get rather confusing. Adding to that confusion are the many passes to choose from: countrywide pass (like the Japan Rail Pass, which is best if you plan to travel between regions a many number of times for the duration of the pass), regional passes (12 options from JR East, 8 options from JR West, 6 options from JR Central, and other rail company-specific passes), down to city-specific passes (city bus passes, city bus and subway combo passes). Which pass should you buy?!? ...that free WiFi is hard to come by. But there are many options for pocket WiFi rentals in Japan: Japan Wireless, PuPuRu, SoftBank, to name a few. But if you'd like to announce to the world that you have arrived in Japan the second your plane touches down, you can also opt to rent a pocket WiFi from Flytpack, a pocket WiFi rental company based in Taguig City whose Japan partner is SoftBank.